The duo responsible for bringing the brand to Northern Ireland is Coffee Republic's Master Franchisees for Ireland, Siobhan and Robert Mooney. 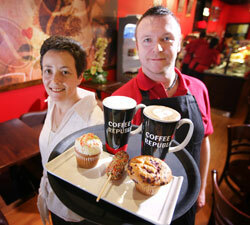 They intend to sub-franchise five additional Coffee Republic Deli outlets this year. Siobhan said: 'We are delighted to launch a flagship Coffee Republic Deli and 'Centre for Training Excellence' in The Abbeycentre, one of Northern Ireland's longest established shopping centres.